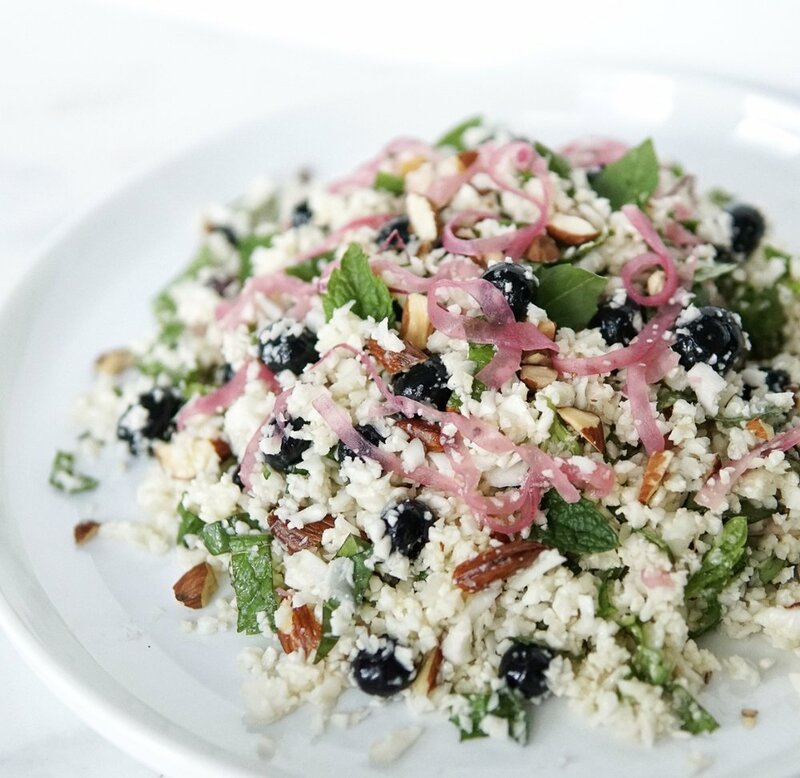 This super simple cauliflower rice salad has the perfect balance of sweet from the blueberries, salt from the pickled red onions, and crunch from the toasted almonds. It's loaded with tons of fresh herbs and tossed in lemon juice, olive oil and salt. It will leave you feeling nourished, refreshed and wanting seconds! Make this salad as a side for your next summer BBQ or weeknight dinner. My favorite way to eat it is with a juicy burger or sausage or a fried egg with a side of avocado. It may seem like extra work but it's not that bad and totally worth it. Just cut the cauliflower into florets (or buy florets), throw them in a food processor and pulse a few times, until it turns into a coarse rice/couscous texture. After this, you can cook it either by microwaving (covered) in a glass bowl OR sauté on the stove for 2-3 minutes to soften. YES. You can find already 'riced' cauliflower at lots of grocery stores now either frozen or refrigerated (Whole Foods, Trader Joes, Costco has it). 1.5 lbs of cauliflower will make about 5 cups of cauliflower rice. This is a good alternative for those who don't have a food processor or the time to make it at home. YES. 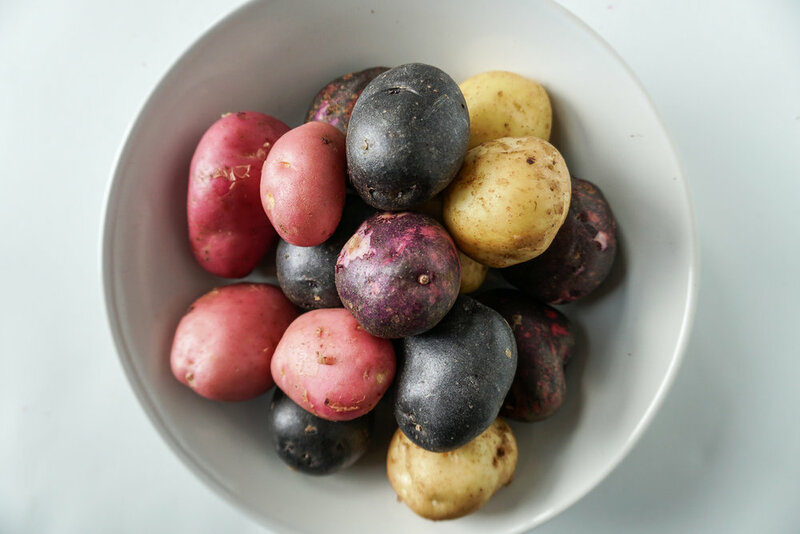 It's a great low-carb, nutrient-dense and gluten-free alternative to grains. Cauliflower is a member of the cruciferous vegetable family, which is known for it's anti-cancer properties. It's packed with nutrients, like vitamin K, vitamin C, B vitamins, potassium and fiber. Place the onions in a large mason jar. Add the water, vinegar and salt and shake vigorously to combine. Press the onions down to submerge them into the liquid. Cover with a lid and place in the fridge overnight or for at least 8 hours. To make the cauliflower rice, add the florets to a food processor in two batches and pulse a few times, or until a coarse rice/couscous texture forms. Transfer to a skillet over medium heat and sauté for 3 minutes, stirring often, just to soften the cauliflower. Alternatively, place the cauliflower rice in a microwavable bowl, cover with a towel, and microwave for 1 minute. Spread the cauliflower around in a thin layer in the bowl so it can cool quickly. Place in the fridge to cool for 10-20 minutes. Once cool, add the blueberries, onions, herbs, almonds, olive oil, lemon juice and salt and toss to combine. Serve topped with more pickled red onions. Enjoy! Don't forget to make the pickled red onions a day ahead!